I descended into the subway toward the metallic tube that would rush me across the city in the dark underground. A man was having a phone call, lingering halfway down the stairs, not yet ready to cut the umbilical cord with the unseen radio tower that connected him to the Matrix. This would be no problem, except that dozens of rushed commuters were piling up behind him like water in a kinked hose. A minute later, on the platform, the subway doors opened and another unconscious automaton, without raising an eyebrow, shifted his heaving bulk juuuust inside the train doors, deeply engrossed in an epic battle of man versus candy. His glacial pace nearly caused a mother and child behind him to get caught in the ruthless jaws of the closing doors. He roused his glazed eyes to meet mine, looking confused, before returning to the cold glow of his colorful puzzles without saying a word. If this is not addiction, I’m not sure what is. Yes, and I’ll make a passing reference to the virtues of cellphones, but I’m not done scaring you yet. You see, I too, have a problem: I can’t remember the last time I went No. 2 without my phone. “Hiii, Miiike,” 2 billion voices ring out. Welcome to cellphone-aholics not-so-anonymous, population: just about all of us. The average person checks their phone 110 times a day. Eighty percent of people check their phones within 15 minutes of waking up. Seventy-one percent of people sleep with or next to their phones. I’m not suggesting cellphones are all bad; I carry mine daily. I am arguing there’s a vast gulf between the two modes of using them: with mindfulness or unconsciously. Recent studies have linked social networking to depression. Using your phone before bed means you’ll fall asleep more slowly and sleep worse. Relying on your phone to relieve anxiety may stunt development of more effective coping skills. People who are constantly connected feel more anxiety. Smartphones do improve lives. Mine makes up for my horrible sense of direction and organizes my schedule. It lets me carry the gift of music everywhere and capture memories with pictures and videos. I can run my business from my phone, and I can find the answer to virtually any question I have. If you’re expecting a call from your pregnant wife, then by all means, cuddle your device. But if you wake up at 3:41 to check if your latest post has new likes, you may have a problem. Walking is a rather important human ability, one that requires most of our attention. You put yourself in danger when you text and walk, and you become an obstacle to people who are trying to get around you. Textwalking can’t be done well. Stop it. Never mind the hygiene issues, this is just weird. I kind of see the efficiency argument, but if this becomes a habit, at least be aware of it — and don’t admit to it in a SUCCESS article. Modern humans evolved about 200,000 years ago. We became the dominant species in the known universe without Snapchat. You can go a day without it. I believe in you. How do you deeply offend a friend who’s hanging with you one on one? Pick up your phone to see if there are any other people (or cat videos) that might be more worthy of your attention. One day I accidentally found the now defunct Vine app and spent three hours scrolling through that world of bizarre short videos. It was a shameless, transparent strategy to avoid real work, and to this day I feel guilty. Humans have been using and abusing technology for eons. In the 1940s, I’d be writing this article about television. In the 18th century, it would be about a new type of fluffy book called a “novel.” In 100,000 BC, my cave neighbor would be grunting about my troubling affinity for stone tools. Whatever your technological poison of choice, there is hope. Let me be your sponsor in the 12-step program for beating smartphone addiction. I once asked my Grandpa Steve how he quit smoking cold turkey. His answer, in a thick Polish accent, was, “I ask myself, ‘Who’s in charge: cigarette or me?’” It’s that simple. Before automatically picking up your device to see what shiny new notifications are demanding your precious attention, ask yourself: “What’s my purpose for using my phone in this moment?” Are you picking the phone up unconsciously or with a specific task in mind? Be honest: Do you really need 74 apps on your phone? Doubt it! Do some soul-searching. Look at each app and ask yourself, “How much time do I spend using this one, and is it truly adding value to my life?” If you’re not sure, start by deleting the app from your home screen. Facebook thinks you need to know immediately which distant acquaintance left a comment in some group you don’t remember joining five years ago. I beg to differ, Zuckerberg. Shut down all app alerts that don’t truly need your attention. Texting while driving is illegal in most places for a reason. Texting steals your attention. You risk less bodily harm when using your phone while walking or at the gym, but you do miss the rich experiences that come with living with uninterrupted focus. A cellphone is a pretty terrible source of entertainment. A five-inch screen and a shrill speaker make for a poor viewing experience. The games lean heavily on mindless tapping. Social media sites are mainly echo chambers for the uninformed. Don’t waste your time. Instead, make a list of real-life activities you love and substitute them for phone time. Playing guitar? Writing at a coffee shop? Walking the neighborhood? Those are some of mine. This could be a whole other article, but in order to beat the fear of missing out — or “FOMO” — remember that comparing yourself to others leads to feelings of either inadequacy or superiority, both of which lead to anxiety. Practice feeling gratitude for what you have and you will never feel like you’re missing out. Your smartphone is always an unwelcome guest at dinner. Sharing a meal can be the most enjoyable part of your day — if you are fully present and engaged with the other people at the table. Nothing creates a divide between yourself and your companions quite like whipping our your phone. If you’re receiving a lot of useless texts or calls in the middle of the night, you probably need to reevaluate your life. 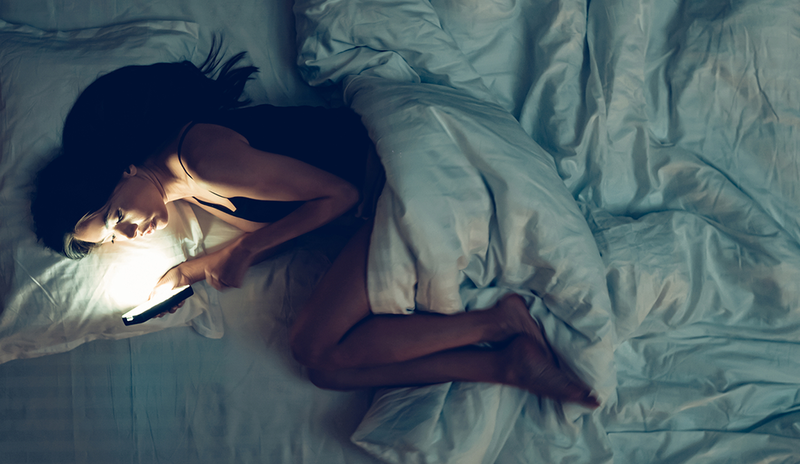 If you’re like most people, nothing is so important you need to let a phone disturb those precious, quiet moments right before bed or after waking. At 10 p.m., my phone tells me it’s time to wind down. The screen-free hour that follows is one of my favorites of the day, where I reflect on what I accomplished, catch up with my lady, and read a good book. You can go longer without it the more you practice. Turn your phone off and put it in a drawer for an evening or a day. Tell people you’re taking a phone break and they’ll know not to miss you. After a while, you’ll start to notice a return to the natural human state of contentment. When my fiancée’s phone shattered on the pavement last year, she decided to go without rather than spend hundreds of dollars replacing it. She was untethered more than a month, and in that time, she didn’t miss her device much. In fact, she kept talking about how she felt calm and intuitively connected to the world. Life can be a challenge from which you escape into your phone, or it can be a daring adventure you embrace fully with presence and an open heart. You can tell which side I’m on. Where do you stand? Michael Pietrzak is the founder of So You Want to Write?, Inc., which helps writers improve their writing and get published. He’s passionate about personal development, CrossFit, and playing guitar.